Gold never spoils, won’t oxidize, and only grows in value every year. Investors tend to predictably react when the world finds a new and exciting use for this classic investment vehicle. Think gold is only good for use in jewelry, electrical connectors, or coins? Think again! There are dozens of applications for this universally-appealing, valuable yellow metal, including in aerospace, the dental and medical fields, in glassmaking and artistic endeavors, and more. The fun aspect about sitting back and watching leaders of industry find new uses of gold is the commensurate market reaction that occurs once gold is again thrust in the spotlight. Let’s look at the unique applications created around gold and the price fluctuations of gold at certain points in history – it’s tied more closely than you might think. Cell phones: Early 2013 saw a staggering 91% of adults in the U.S. owning and using a cell phone. And the majority of those communication-focused individuals chose to outfit themselves with a smartphone from one of the major players like Apple, Samsung, or LG. The important piece of the puzzle? The use of gold in cell phones is an important part of the intricate inner workings found within the designer exteriors. What was the price of gold in 2013? It was just a couple of dollars per ounce off the high over the previous 10 years. Medical field: Gold has been used for some time now as a revolutionary, albeit seemingly improbable cancer treatment option, and the market has certainly reacted to this new application. Though there are a lot of factors that drive the price of gold, most of the news surrounding the medical uses for gold, specifically its ability to help in the fight against cancer, surfaced in late 2015-early 2016. Gold’s price per ounce rose from $1,067 at the end of 2015 to $1,229 just three months later. That’s about a 15% value increase in three months. Miscellaneous innovations: Gold is the classic investment hedge against market instability, but it often plays a front-and-center role in leading edge tech innovations and other revolutionary applications. For instance, just a few months ago a designer claimed to have created a way to integrate flexible gold into clothing fibers – essentially creating solar energy-capturing apparel with dozens of uses. Gold has also shown promise in creating advanced data storage devices that are incredibly small, an obvious companion to the influx of portable devices in use today. These ideas are mere months old, and the price of gold has risen from $1,261/ounce on August 8th, 2017 to $1,343/ounce as of September 5th, 2017. That’s a 5% increase in overall value in about a month. 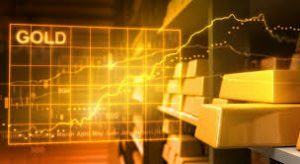 The market tends to react strongly when new applications for gold are discovered, and the price of an ounce of gold is firmly entrenched in investors’ overall market sentiments. When investors feel good about the global and domestic geopolitical situation, gold tends to soften. But when equities show signs of strain, the world seems to be in chaos, or a new application for this incredibly important precious metal becomes evident, gold tends to increase in value quite rapidly. For more information on the precious metals market and gold investing, contact American Bullion today.